display 4 cars and a 7,000 sq ft state of the art workshop to ensure commitment to serve the customers beyond expectations. The dealership was inaugurated by Ravi Bhatia, Vice-President, Fiat Group Automobiles India Pvt. 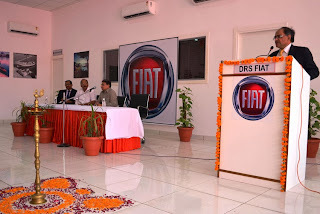 Ltd.
"Fiat India views Faridabad as a very strategic market and the inauguration of an exclusive dealership is in accordance with our strategy to capitalise on this potential. We are confident that our association with DRS Motors Pvt Ltd will play a crucial role in identifying the customer base and enhancing customer experience in Faridabad. With DRS Motors Pvt Ltd, we are associated with a partner who has over 20 years of experience and market knowledge of the automobile trade," said Bhatia. "Fiat cars are prominent all over India for their aesthetic design and their engineering superiority. We are extremely proud to become exclusive dealers of Fiat Group Automobiles India Pvt. Ltd in Guwahati and with an experienced management team and well trained technicians we are confident of replicating world class dealership and after-sales experience to the car buyers here," said S. Mohanty, Director, DRS Motors Pvt Ltd.